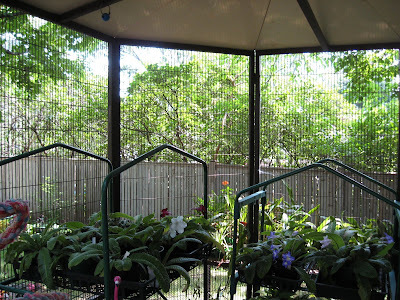 This is where the streptocarpus plants are living outside for the summer. Most are putting out a few blooms although I am not so sure that there is really enough bright light to get them to bloom well. Direct sun seems to burn mine, but this works to get them growing and filling out. There aren't many insect problems this way either. I will however, spray them with the Imidacloprid before they come inside for the winter.